Learn how to compost, recycle, and reduce your carbon footprint. Drop off recyclables, e-waste and ink/toner cartridges. Visit booths and receive info from government agencies, environmental, health, social and cultural organizations. Games available for kids and adults, as well as pop-up library/learning installation courtesy of The Uni Project. Student volunteers will be assisting with flower plantings and litter cleanup. Opening remarks and greetings at 12pm. To celebrate Earth Day next weekend, New York City is closing some of its streets to cars. As part of an annual event run by the city’s Department of Transportation, 30 blocks of Broadway from Times Square to Union Square will be closed on April 27 to allow pedestrians and cyclists to roam and ride free between 9 a.m. and 3 p.m. Along the nearly two-mile route, the city will offer some environmental programs and nonprofit organizations will be on-site to educate walkers about climate change and sustainability. The amount of plastic that's been dumped into the ocean has been increasing, according to a new study , and the problem will probably get worse. Mmuseumm (yes, the spelling is unusual) displays collections of small objects in a very small space. Its curator says they tell important stories. As finishing touches are being put on the space before vendors move in, Untapped Cities got a sneak peek at the new market space and learned about its new features and design, and how the NYCEDC will support and encourage the growth of existing vendors making the shift, and preserve the history and culture of the longstanding market. The City Council has approved a 5-cent charge on paper bags, making it harder to hide from the statewide ban on single-use plastic ones. NY4P and the New York League of Conservation Voters are holding an Earth Month photo contest! Share pictures of your favorite park, playground, or other greenspace using the hashtag #PlayFair. Tell us what that park means to you and why it’s so important. Don’t forget to include the name of the park and what borough it’s in. The contest ends Monday, April 29, and the winner will be announced later that week. Day of workshops featuring important life issues impacting Asian women and their communities. Learn from professionals and community leaders about: Asian American Identity, Professional Career Advancements and Resources, Pro Bono Clinic, Mental Health, Social Activism and more. This five-part class begins with a focus on the iconic Jewish Lower East Side before following the migration of New York’s Jews – uptown and across the rivers. Most sessions will include walking; please wear comfortable shoes and dress appropriately for the weather. In these ten sessions, explore the religious and cultural connections between Jews and Muslims of that period. This course is a continuation of our exploration of Jews and Muslims in history, but new participants are welcome! Features a presentation of 2019 research on experiences, policies, and practices that impact Asian American women in the workplace from the Nielsen Corporation, keynote remarks by Tina Tchen, panel discussions, and an evening networking reception (5 - 6:30 pm). New York's Unique and Colorful Chinatown! press room about us see chinatown © 2006-2015 ExploreChinatown. All rights reserved. The Explore Chinatown campaign is a project of the Chinatown Partnership Local Development Corporation. 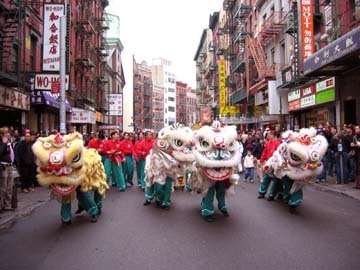 Chinatown New York City is located in one of the oldest neighborhoods in Manhattan. Whether you’re seeking the best in Chinese food, Asian groceries, shopping or guided tours, Explore Chinatown to find it all!